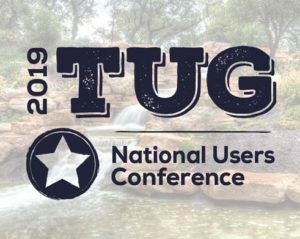 Registration now open for the 2019 TUG National Users Conference on May 14-17, 2019, at the JW Marriott San Antonio Hill Country Resort and Spa in San Antonio, TX. Choose from 200+ different live lecture and hands-on lab sessions – session selection available soon! Visit www.TUGconference.com for more information, pricing, and registration for the 2019 TUG Conference.